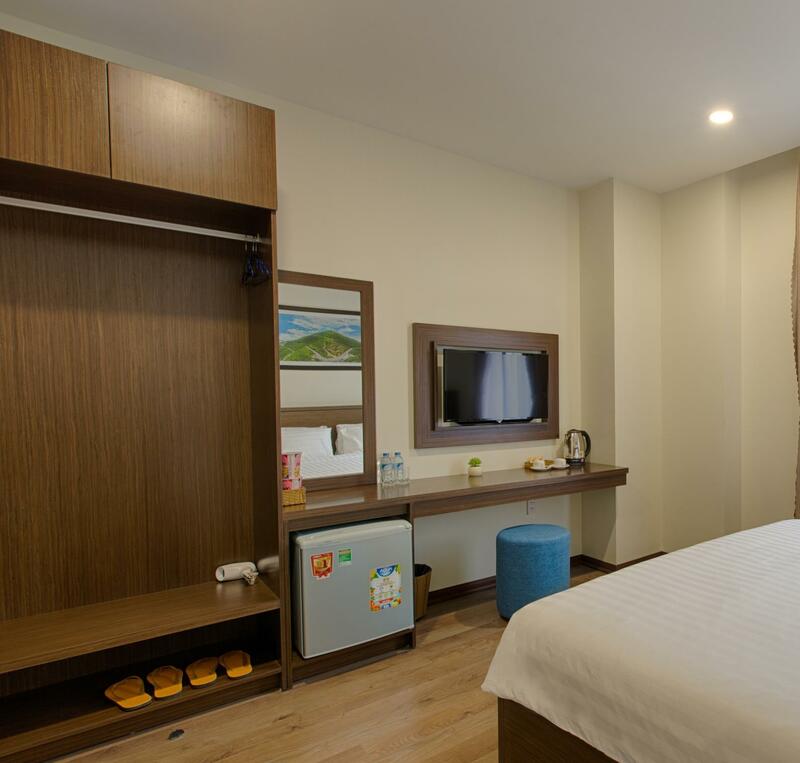 "Deluxe twin room is roomy, quiet and comfortable with clean..."
Have a question for Central Hotel & Spa Danang? "Staff was friendly and helpful, spa was good for the price." Located in the Hai Chau area, Central Hotel & Spa Danang is the ideal point of departure for your excursions in Da Nang. From here, guests can make the most of all that the lively city has to offer. With its convenient location, the property offers easy access to the city's must-see destinations. 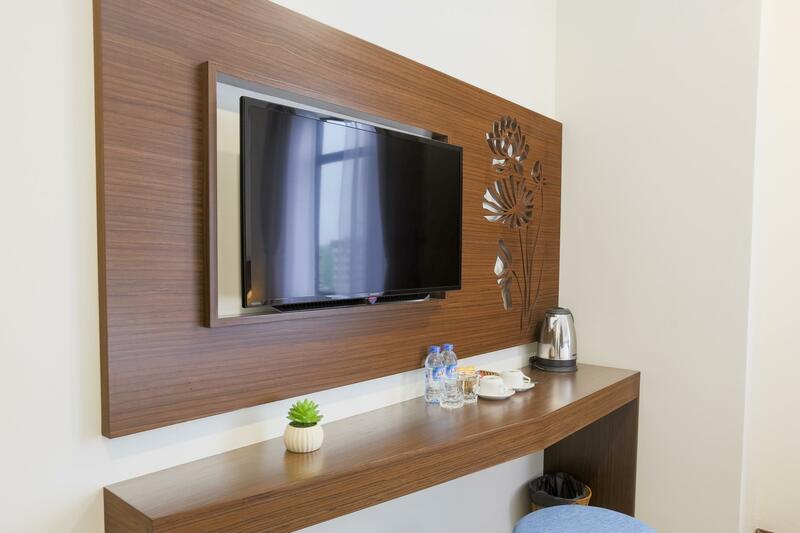 Offering guests superior services and a broad range of amenities, Central Hotel & Spa Danang is committed to ensuring that your stay is as comfortable as possible. Guests can enjoy on-site features like free Wi-Fi in all rooms, 24-hour room service, 24-hour security, daily housekeeping, postal service. All guest accommodations feature thoughtful amenities to ensure an unparalleled sense of comfort. The property offers many unique recreational opportunities such as sauna, outdoor pool, spa, massage, solarium. 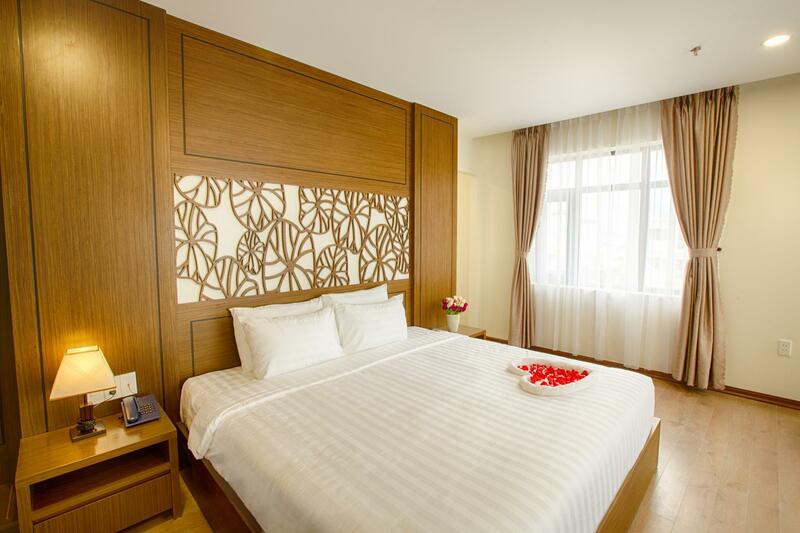 Central Hotel & Spa Danang is an ideal place of stay for travelers seeking charm, comfort, and convenience in Da Nang. "Staff are friendly and helpful especially Lan who is so help..."
Deluxe twin room is roomy, quiet and comfortable with clean sheets and great shower. Pool is on the roof top with nice view. Breakfast is also good and has adequate selection considering it’s a boutique hotel. The staff are attentive and very helpful and would help you arrange transport to places on interest. 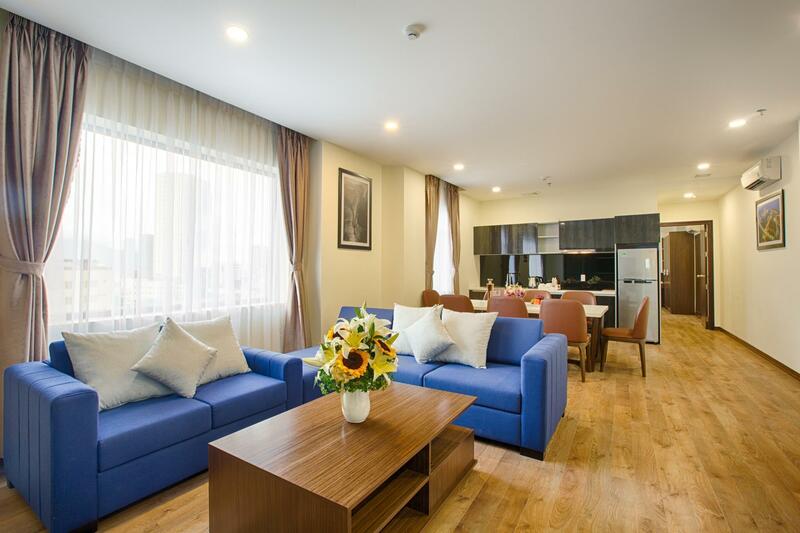 Located centrally and convenient to walk or taxi to the beach or night market. Overall. A very pleasant and enjoyable stay! 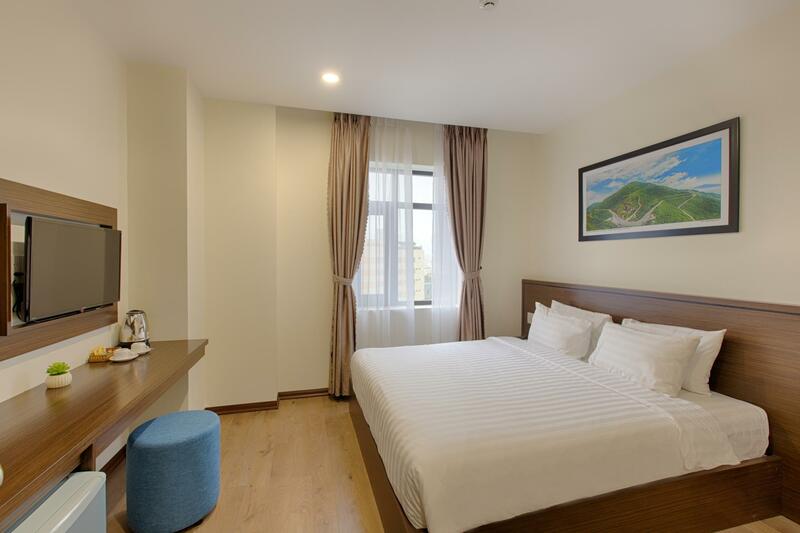 I think it is a good choice because the hotel is clear and have a nice breakfast .Although it have not a kind of choice in breakfast , the quality of food is higher .The toilet is very clear and the staff service is good . Disappointedly , we bought a ticket from the hotel , but it appeared the accident,so we waste a lot of time .We could not get the ticket smoothly , so our plan was broken.Luckily, the hotel's manager help us to solve the problems. Great place to stay. The location is good and convenient for easy travel. Rooms are clean and well equipped. Breakfast is good with Vietnamese choices. Staff are friendly and helpful especially Lan who is so helpful. Nice hotel. We really enjoyed our stay here. Booked a Superior Double Room for a one night stay. Room was small but comfortable. Unlike many hotels in Da Nang at the same price level, the hotel is very quiet and you can hardly hear noise from the street. Staff was friendly and helpful, spa was good for the price. However, water pressure was quite low during my stay. Everything else was good. Would recommend! Dear Ms Bo Yan Pauline Lee We are truly heartened to receive your generous review of Central Hotel & Spa Da Nang. Thank you for letting us know how much you enjoyed your stay with us. We will pass your compliments to my team and be sure that the whole team are made aware of your kind words. We look forward to having you with us again and again in the near furute. Wish you are always young, lucky and have a lot of success in your life. Best regards, Central Hotel&Spa Danang. Room is basic but clean and comfortable. Good location. Can be a bit noisy in outdoor corridor, but wasn't really a bother for our stay. Pool on rooftop looked good for a dip on a hot day. Lovely hotel, great location, good breakfast and helpful staff what more could you want. Front office staff are always helpful and courteous during our 4 days 3 night stay. Good services rendered. Our rooms are clean and the spa is good as well. Value for money! Thumbs up! New hotel. Good location. Reasonable price. Beautiful pool at the 9/F. Clean room. Breakfast has lots of selection and items change everyday. Spa with 40% discount. Very good services by staff who arranged decent decoration to my room for celebration of our wedding anniversary. There is door hinge problem and door needs to be closed with force and making noise and soundproofing can be improved. Anyway a very good choice for budget traveler. Dear Mr Chris Tsang, Thanks for your one more wonderful review, and it was a pleasure having you with us and being able to meet you in your 20th wedding anniversary at our hotel. Creating memorable experiences for our guests are always what we strive for and I am delighted that you both really enjoyed that. I hope to have the pleasure to welcome you back for another memorable stay should you visit Da Nang city again in the future . From the bottom of our hearts, we want to say thank you again. Wish you and your love all the joys of a wonderful day. Best regards, Central Hotel & Spa Danang Team. It is convenient as you can find supermarket and stores nearby. The staff are very nice. We woke up late to airport so we don’t have time to enjoy the breakfast. The receptionist asked us whether we wanted sandwiches to take away. They made it immediately. That was so delicious! Dear Ms Kaling, How fantastic to receive comments regarding your recent stay at Central Hotel&Spa Danang. We are delighted to read that you experienced great service and enjoyable your breakfast. I have shared your comments with the rest of the team. Thank you again for sharing your experience, and we do look forward to welcoming you back on your next trip to Danang city. With all the best! Kind regards, Central Hotel&Spa Danang Team. Staff is great. Location is awesome. Must try the spa, value for money. Only thing is the choice of food for breakfast. I've stayed in this hotel for two nights. 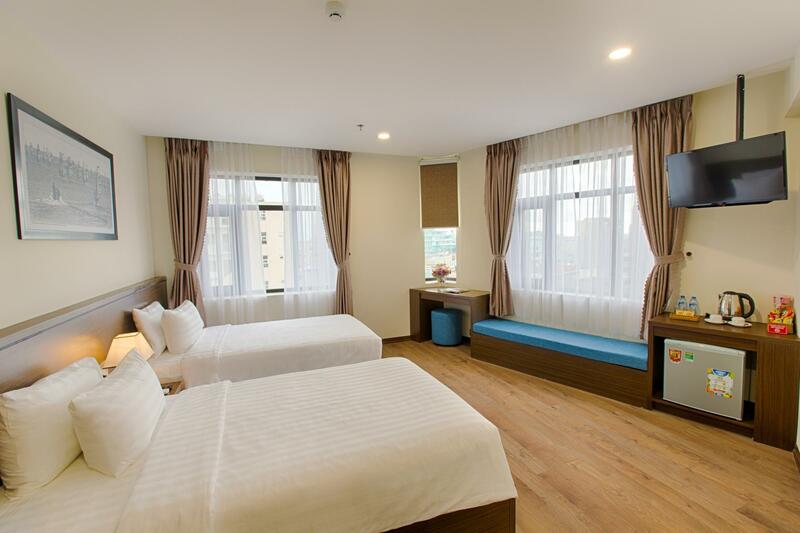 The hotel is location in the center of Danang city. It has lots of small shops and restaurants around. Beds are clean, room is big, but bathroom is small and does not fit the level of hotel. Breakfast is just enough for travelers. No comfortable chair in the room just a stool, and no power jack set for desk, so the room is not friendly for guests who have to work or use laptop in the room. After a long night-train journey from Hanoi, we arrived to ... no one. No luggage valet near the 20 stair-steps we had to climb with heavy bags...no one in reception, until a woman and man came running out from the back restaurant. Indifferent and lackadaisical. When we got to the room, there were only towels for two (we were 3), so I went back down to...no one. Had to go back and call for the receptionist in the kitchen, who proceeded to act astonished that I needed another set of towels. Life is too short and there are too many good hotels to put up with a place like this. The building is okay, the inside is sterile; the room was spacious but ridiculously planned, with a small double bed that had my wife and I sleeping on the edges (big enough room for a queen- or king-size). Not enough power points; not one chair (a little footstool and a bench we used to place luggage). Ach, terrible! I could go on lambasting the place, but it just gets my ire up again. Don't stay here! Dear Mr James Emerson, Thank you very much for taking your time to share with us your recent experience at Central Hotel&Spa Danang. We are really sorry to hear about your problem happened during your staying. We will try our best to improve our services daily and look forward to welcoming you back in the near future. Wish you and your familly a day full of joy and luck. With thanks & best regards, Central Hotel & Spa Team. Clean Hotel and friendly, helpful staff, especially Sarah Nguyen Tram. All staff are helpful in connect private car for transport and answer questions. Dear Ms Leung Lai Kuen. Warmest greeting from Central Hotel&Spa Danang and thank you very much for your wonderful review. We hope to have the pleasure to welcome you back for another memorable stay should you visit Da Nang city again in the future . From the bottom of our hearts, we want to say thank you again. Wish you all the joys of a wonderful day. <3 Best regards, Central Hotel & Spa Danang Team.